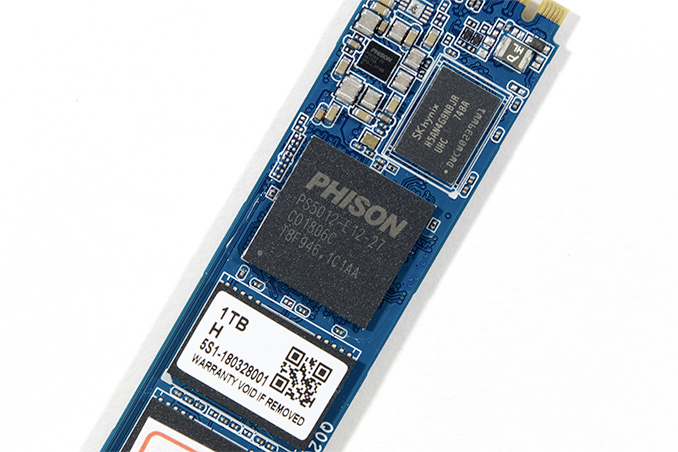 Phison and its partners have been absent from the high-end SSD market in the past couple of years. This is partly because its memory supplier, Toshiba, was somewhat late with its SSD-grade 3D NAND memory, but also partly due to its own product planning. Looking to put an end to this absence, this week the company has announced that it has initiated mass production and shipments of its latest PS5012-E12 controller, which is expected to bring Phison and its allies back to the high-end market segment. The Phison PS5012-E12 controller features eight NAND channels with 32 CE targets, a DDR4/DDR3L interface for DRAM caching, and a PCIe 3.0 x4 interface. As for features, the chip supports the NVMe 1.3 protocol, LDPC-based error correction, a variety of encryption methods (AES-256, TCG Opal, TCG Pyrite), and a number of proprietary technologies to improve reliability and durability of SSDs. Notably, the controller is made using a 28 nm manufacturing technology, which is a very advanced fabrication process for SSD processors. This should ensure that it packs enough compute horsepower for proper ECC and signal processing when working with modern 3D TLC and 3D QLC NAND memory. Phison will offer three versions of the PS5012-E12 controller: the original one for high-end client SSDs, the PS5012-E12C with a reduced number of channels and CE targets for mid-range drives, and the PS5012-E12DC for enterprise drives with some additional performance and feature set enhancements. Speaking of performance, Phison promises that high-end SSDs based on the PS5012-E12 will offer up to 3450 MB/s sequential read speeds, up to 3150 MB/s sequential write speeds, as well as up to 600K random read/write IOPS. Phison says that its partners have started development of over 20 projects based on the PS5012-E12, but does not disclose whether this includes the cheaper and datacenter variations of the controller. Keeping in mind that the chip is in volume production and Toshiba’s 64-layer 3D TLC NAND is readily available, expect drives based on the PS5012-E12 to hit the market in the coming months. So far, Patriot and MyDigitalSSD have confirmed plans to use Phison’s PS5012-E12 controller, with the latter already taking pre-orders for the BPX Pro. In the meantime, Phison has a long list of partners who currently offer higher-end, mid-range, and entry-level SSDs powered by Phison’s controllers, including Corsair, GIGABYTE, Kingston, Lite-On, TEKQ, Team Group, Toshiba, Palit (Galax, KFA2, etc. ), PNY, ZOTAC, and so on. Why, it's the best deal if you wanna go full SSD. And I mean THE ONLY choice. Just a few days ago Samsung finally dropped the price for the 4TB 860 EVO below $1000. One could convert to IOPS, assuming the random read/writes were all done with 4 KB payloads - so e.g. 55 MB/s would then translate to 55,000/4 = 13.8k IOPS, and 325 MB/s then equates to 81.3k IOPS.